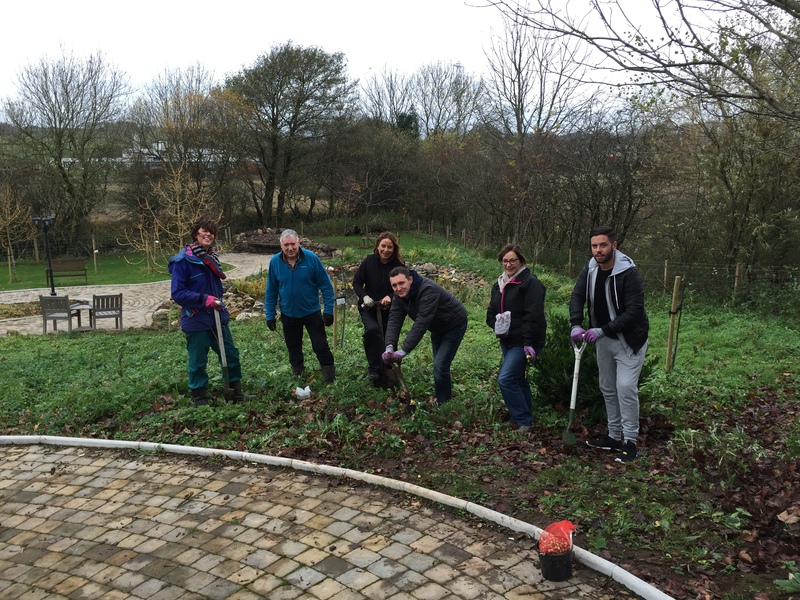 Five hardy volunteers from Bank of Scotland have been engaged in a race against time to beat Hurricane Abigail and get the new Community Garden at St Vincent’s Hospice in Howwood ready for winter. The volunteers made short work of planting well over 2000 bulbs – bluebells, snowdrops, daffodils and winter aconytes in the garden’s wildflower areas, as well as various Alliums, muscari, pushkinias, Eranthis, Camassia, and Erythroniums in the flower beds. The garden is now well set up to burst into life in spring. ‘St Vincent’s Hospice relies on the support of local companies and supporters, both financially and for volunteers. With our Garden Project this is especially true, and recently we have been very fortunate to have been the recipients of many donations from local supporters, including W. Gibb Stuart and the Flightpath Challenge Fund. This has allowed us to start buy many more trees, shrubs, plants and bulbs,” said Katrina. With a large area to tend, there is always plenty of work to be done so if you would like to join the growing Volunteer Gardening Team, please email the Hospice at info@svh.co.uk for information or phone 01505 705635. The Community Garden at the Hospice on Midton Road in Howwood is open to visitors every day and the Barn Tea room is open Mon-Fri 10am til 4pm.